Ste 'Keyz' Simpson, Musician and Producer. As a young prodigy Ste's talents shone through from an early age. 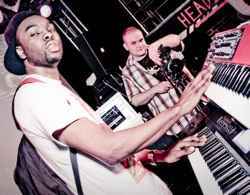 Starting out as a multi instrumentalist Ste has progressed into music production and co-writing and is currently working very closely alongside Producer and turntablist DJ Vadim, appearing extensively on his 2009 BBE record release 'U Can't Lurn Imagination' and as a close allie in his onstage shows since 2007. Having reached the milestone age of 25 Ste has already accomplished a careers worth of achievements and continues to push on in pursuit of his dreams, the next quarter of a century promises to be ground-breaking!